Global Warming Demystified: The Science, The Consequences, and The Solutions. In this presentation, Dr. Bennett will give the foundations on how to speak intelligently about the science behind global warming, and show why the solutions to this important problem are ones that people of all political persuasions can agree on. 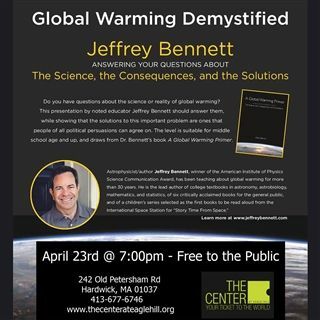 The talk is based on Dr. Bennett's global warming primer. This FREE Lecture Series is open to the public.